Dermatology is the medical specialty which deals with conditions of the skin, hair, and nails. Our board certified dermatologists, Dr. Sara Brooks and Dr. Yamini Saripalli are available for general skin checks and treatment of skin conditions. 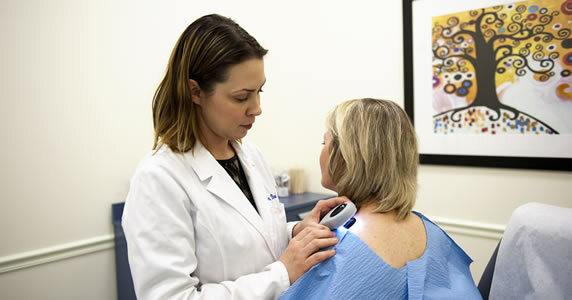 They are fellowship trained in the expert identification and treatment of melanomas and other skin cancers. Injected medications used to relax certain muscles of the face, resulting in fewer wrinkles, and a more youthful appearance. Volumizing and wrinkle reducing injectable natural materials which are used to restore the facial contours seen in younger skin. They are mostly used in the cheeks, the angle of the jaw, temples, and lips, as well as areas of deep wrinkling such as the nasolabial folds and marionette lines. They can also be used for filling depressed scars as well. These are peels, usually consisting of salicylic, glycolic or lactic acid, which is applied directly on the face (or affected areas) for the treatment of conditions such as hyperpigmentation, acne, and skin rejuvenation. For more information about specific skin conditions, a helpful resource is the American Academy of Dermatology, which has a web page dedicated to patient education.